I caught this funny shot walking through a park the other day. It’s a group of Filipino domestic workers, with a group of wheelchair-bound elderly people. I would assume that the maids are supposed to be taking the elderly folks out for a walk. But instead they have parked up the old folks in a row, and are sitting around liming and eating snacks. I have a feeling that these old people probably cannot speak anymore, or they would surely tell their family, ha ha! 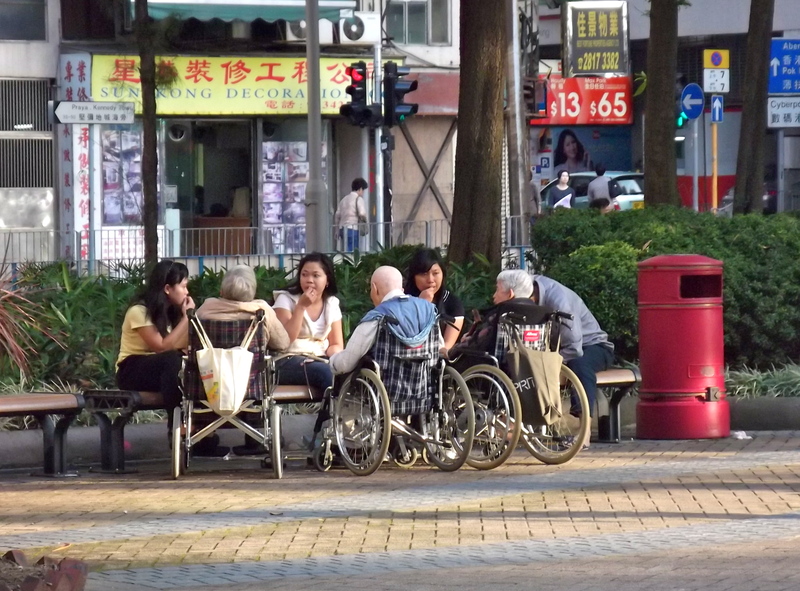 Because Hong Kong is a very competitive society, due to the high cost of living, most people simply do not have the option to stay home and mind children or take care of old folks. So in Hong Kong there are thousands and thousands of maids and domestic workers, primarily from the Philippines and Indonesia, who come here to do all the household duties that people no longer have time to do. This includes the grocery shopping, the laundry, walking the dog, dropping the kids to school, cleaning, cooking, and taking care of old folks. Imagine the maids actually LIVE with the family — in a tiny room in those tiny apartments! — full time, all day, six days a week. And get this — the really rich folks have a maid for EACH CHILD! Some people even have a full time live-in maid just to take care of their PETS!!!! Anyway, I don’t blame the maids for sitting around and liming instead of actually walking the stupid dog or pushing around the old people for fresh air. Imagine having to live with a family and do their bidding 24 hours a day and pretty much always having to do what you are told. If I were them, I’d seek out my friends for a stress-relief liming session too!